Home > About > Our Doctors > Steven Daines, M.D. Biography: Dr. Daines is double board certified in Otolaryngology - Head and Neck Surgery and Facial Plastic and Reconstructive Surgery. In addition, he is an active participant with SCARS Foundation, an organization dedicated to supporting the continuing professional development of physicians through education, research, and community service. As a facial plastic surgeon, Dr. Daines is concerned with giving his patients the most sophisticated level of reconstructive care. By working alongside dermatologists, Dr. Daines and his colleagues at SCARS Center ensure that skin cancer patients are given the best treatment options. This is a key component to curing difficult skin cancers and is one of the reasons why referring physicians see such high success rates with patients they have sent to SCARS Center. By combining advanced Mohs surgery with reconstructions and multi-stage reconstructions, Dr. Daines and his colleagues are able to provide patients with higher cure rates, less chance of recurrence, less chance of scarring, and an increased opportunity for cosmetically desirable outcomes. Dr. Daines has been recognized by the Orange County Medical Association as a Physician of Excellence every year since 2016. Additionally, he has been recognized by SuperDoctors as a physician having attained a high degree of peer recognition and professional achievement. 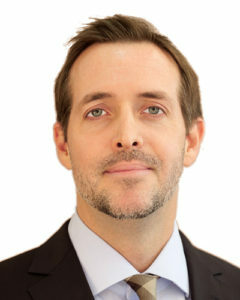 Dr. Daines is also listed as a Top Doctor by RealSelf for his outstanding work in cosmetic surgery. Research: Since 2008, Dr. Daines has written numerous medical publications and given dozens of local and national presentations, informing his fellow surgeons about advancements in facial reconstructive surgery. He is passionate about his active participation researching nasal reconstruction, chronic sinusitis, and the psychological considerations in cosmetic surgery.